Son of MB has promised to cook for the family for 7 straight nights in return for his Mumsy mowing the lawn for his sister (the new Mum). Mumsy finds this highly amusing and can't help snickering each time she recalls Son of MB negotiating a deal so he could avoid doing the dreaded lawnmowing. 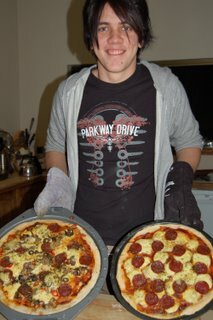 Last night was the first night with the new chef and a relatively easy meal, home made pizza (including home made yeast dough). The pizzas were very good, but the dough wasn't quite right, not quite sure what went wrong there. The only thing missing was anchovies but Mumsy and MDR were in the minority in that regard. Looking forward to tonight's dinner, as yet no information to hand on what will be served. Sunday night will be roast night, Mumsy bagged a huge leg of roast pork on Friday at Woolies which nearly gave the the checkout chicklette a hernia. ... at least you have a son who has a go! 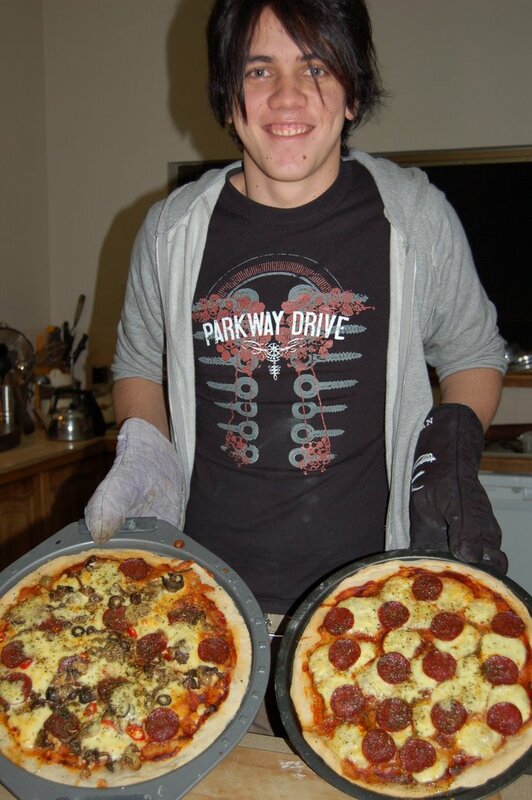 My nearly-16 y/o has perfected cooking pizza - get the pizza base as prepared by Mrs BB, add plenty of meat and cheese, hand back to Mrs BB, wait, eat. My nearly-19 y/o daughter doesn't cook - she just eats out. I'm keen to review her financial planner sometime before the Sherriff arrives to select items of hers for possession. Our (Mrs BB's and me) 6 y/o daughter could out-cook (or at least out-help) those two gastronomic wunderkinds. Go Paul! Although I suppose the lawn-mowing would've been the easier option, I'm sure you'll do a great job. But how could you cook bloody Italian food after those soccer matches...? Regarding the checkout chick, I got a nice stpry as well. For the summer camp I worked on we bought about 500 1.5 litre bottles of soda water, which already ofreaked the checkout chicks out at the supermarkets (we had to buy the complete stocks of three different shops). Now with us Germans being as environment-coscious as we are, on every bottle there is a deposit of 0.25 Euro (about 0.50$-AUS). After one week, we went to a super-market called Extra to return the bottles. They have machines which scan the bottles and print a receipt after you've inserted all of your empties. We occupied both machines and within five minutes, the first one broke down. The second one followed short after, but came back to life several times before dieing completely. We felt quite bad because a long queue had formed behind us and retracted discretely, one of us went to the check-out to receive the money whilst the others stormed the Aldi-store next door. There, quite an audience formed as we went on to throw about 100 bottles into their machine, which turned out to be much more reliable and functional. "The most aggravating thing about the younger generation is that I no longer belong to it." Hi SB, I'd love to have seen those poor checkout chicks, they probably thought you guys were playing a joke on them! Did you recommend to the Director to buy a Soda Steam machine? although the Soda Stream machine might seem handy, I think we would've needed at least 4 machines to cope with the amount of water the kids drank. Luckily, bottled wateris dead cheap here, only 19 cents per 1.5 litre bottle.